Technology variations, the recent advances in design, and fragmented manufacturing have resulted in a high degree of competition in the global circulating fluidized bed (CFB) boilers market. This in turn has compelled the leading enterprises in the market such as Alfa Laval AB, AE&E Nanjing Boiler Co. Ltd., Bharat Heavy Electricals Limited (BHEL), and others to focus on direct marketing. As per Transparency Market Research (TMR), the majority of these companies usually enter into collaborations and agreements or set up joint venture to utilize shared boiler approach. The energy sector is currently focusing on increasing the power output of various CFB boilers and at the same time ensuring the reduction of emissions. A high degree of competition therefore prevails currently in the market. However, TMR expects the degree of competition in the CFB boilers market to be medium in the forthcoming years. Opportunities in developing regions have proven exceptionally lucrative for the CFB boilers market. A lead analyst at TMR said, “Asia Pacific boasts a high demand for industrial and infrastructural progress that have significantly contributed in making the region one of the fastest growing markets for CFB boilers.” The region exhibits high demand for energy rising from industries such as automotive, manufacturing, infrastructure, steel, and oil and gas. With the energy requirements projected to increase in the forthcoming years, the CFB market sees huge growth potential in Asia Pacific. The analyst further said, “Demand for CFB boilers will increase in response to the rising environmental concerns and implementation of stringent emission control norms.” While industrial growth and commercialization continue to remain indispensable aspects for economic growth, harmful emissions from industries have been creating alarm globally. Various international organizations have thus come forward to curb emission of hazardous substance from industries. Since installing CFB boilers reduces the impact of industrial processes on environment, their demand is anticipated to increase at a robust pace in the forthcoming years. Besides these, CFB boilers also have low running cost, higher reliability, and better fuel flexibility, which also augur well for the market. Despite exhibiting significant advantages over its substitutes, the high maintenance cost of a CFB boiler is its most notable drawback. The boilers designed for subcritical operations however require lesser maintenance cost as the process condition they operate in does not affect boiler walls for longer periods. Contrary to this, the supercritical and ultrasupercritical boilers usually operate under extreme conditions. Oxidation, heat, and other similar factors affect these boilers at a higher rate than their subcritical counterparts. This results in rusting and thus quicker erosion of reactor walls, which fuels their overall maintenance costs. Nevertheless, with the emphasis on clean energy increasing globally, TMR expects the deployment of CFB boilers to considerably increasing in the forthcoming years. 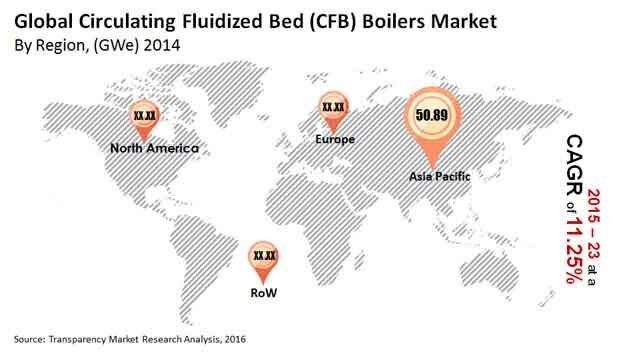 China, Japan, and Australia together held the largest installed base for CFB boilers in 2014. The segment encompassing these countries accounted for a share of 34.67% in the market in the year. The development of power markets in India and China is projected to give significant impetus to the market for CFB boilers in Asia. By application, the market was led by the oil and gas industry in 2014. According to TMR, in 2014 the global installed capacity of CFB boilers stood at 92.0 GWe. Exhibiting a CAGR of 11.25% between 2015 and 2023, the global CFB installed capacity is expected to reach 241.9 GWe by the end of 2023. Developing countries to exhibit most lucrative opportunities for CFB boilers market. High maintenance cost of CFB boilers emerges as their most important drawback. China, Japan, and Australia held over 34% of the global CFB market in 2014.